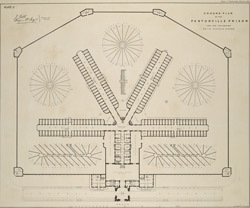 Pentonville prison was built in 1840-42 as the model prison on the separate system. This had not previously been tried in this country and it was Sir Joshua Jebb who planned the structure, basing it on Haviland's Eastern Penitentiary in Philadelphia. From the central hall radiate five wings where selected male convicts underwent a term of probationary discipline of about 18 months. When the prison was built it was remarked that its bright, cheerful and airy quality resembled the Crystal Palace stripped of its contents.